2014 January « Peeter Joot's (OLD) Blog. where . Here is assumed to be an extremum of . This follows from a generalization of the Gaussian integral result. Let’s derive both in detail. Observe that we can recover eq. 1.1.1 by noting that for that system was assumed (i.e. was an extremum point), and by noting that the determinant scales with since it just contains the second partials. For normal incidence, without assuming that the reflected and transmitted waves have the same polarization as the incident wave, prove that this must be so. 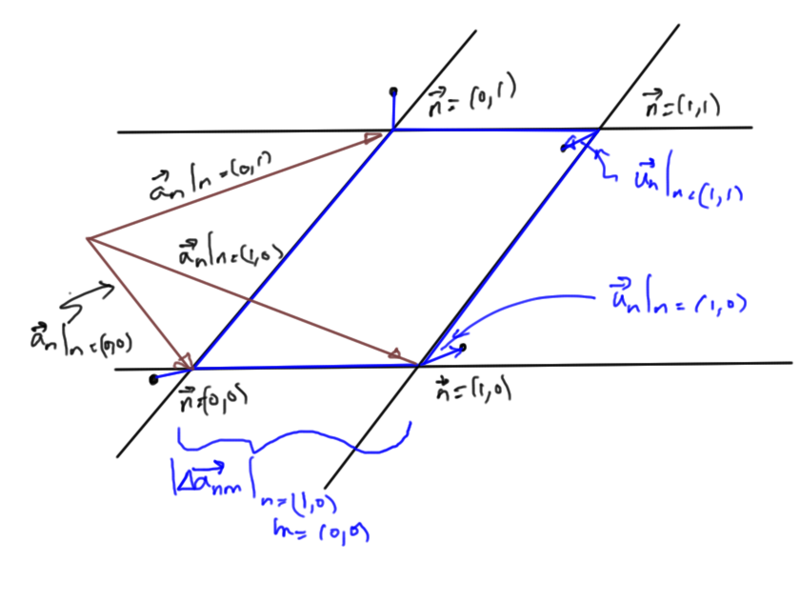 Effectively the sign for the magnitude of the transmitted and reflected phasors is toggled, but the polarization vectors are also negated, with , and . The resulting and are unchanged relative to those of the solution above. Effectively the sign for the magnitude of the transmitted phasor is toggled. The polarization vectors in this case are , and , so the transmitted phasor magnitude change of sign does not change relative to that of the solution above. This time, the sign for the magnitude of the reflected phasor is toggled. 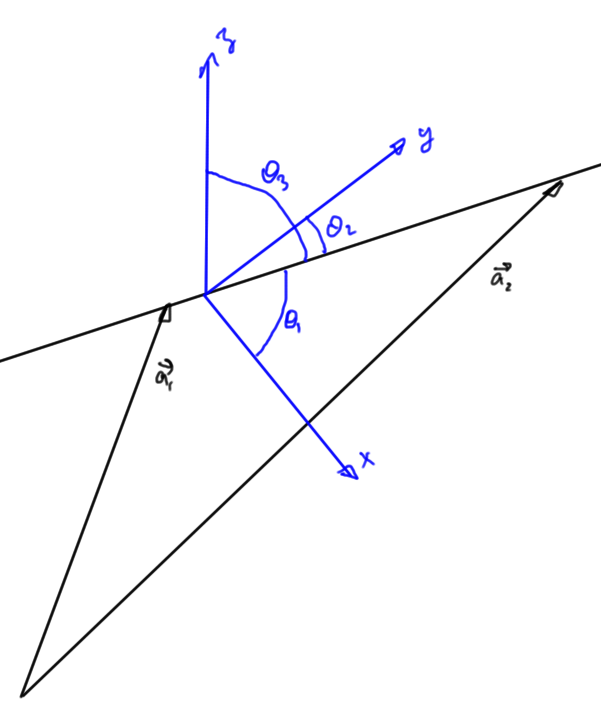 The polarization vectors in this case are , and . In this final variation the reflected phasor magnitude change of sign does not change relative to that of the solution. We see that there is only one solution for the polarization angle of the transmitted and reflected waves relative to the incident wave. Although we fixed the incident polarization with along , the polarization of the incident wave is maintained regardless of TE or TM labeling in this example, since our system is symmetric with respect to rotation. D.J. Griffith. Introduction to Electrodynamics. Prentice-Hall, 1981. Let’s tackle a problem like the 2D problem of the final exam, but first more generally. Instead of a square lattice consider the lattice with the geometry illustrated in fig. 1.1. Either way, we see that leads to only horizontal or vertical motion. In the first BZ, that is one of or . On the exam, where we were asked to solve for motion along the cross directions explicitly, there was a strong hint to consider a rotated (by ) coordinate system. This clearly differs from eq. 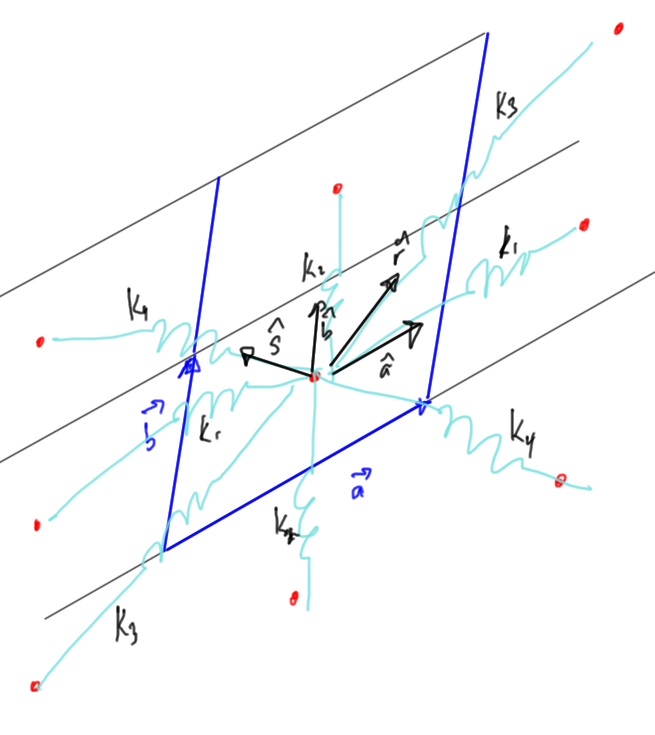 1.0.16d, and results in a different expression for the eigenvectors, but the same as eq. 1.0.20.20 for the angular frequencies. The exam asked why the cross coupling is required for stability. Clearly we have more complex interaction. The constant surfaces will also be more complex. However, I still don’t have a good intuition what exactly was sought after for that part of the question. 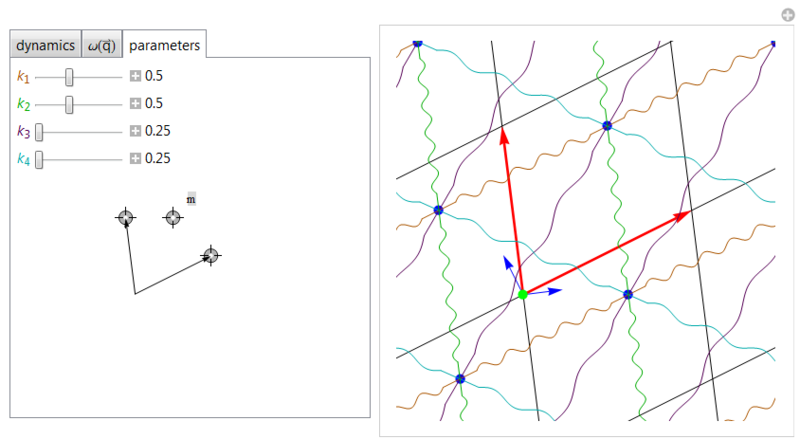 A Manipulate allowing for choice of the spring constants and lattice orientation, as shown in fig. 1.2, is available in phy487/oneAtomBasisPhonon.nb. This interface also provides a numerical calculation of the distribution relation as shown in fig. 1.3, and provides an animation of the normal modes for any given selection of and (not shown). Fig 1.3: Sample distribution relation for 2D single atom basis. After having had some trouble on a non-1D harmonic oscillator lattice problem on the exam, I attempted such a problem with enough time available to consider it properly. I found it helpful to consider first just two masses interacting harmonically in 3D, each displaced from an equilibrium position. This was solved in absolute and displacement coordinates, and then I moved on to consider a linear expansion of the harmonic potential about the equilibrium point, a problem closer to the exam problem (albeit still considering only two masses). 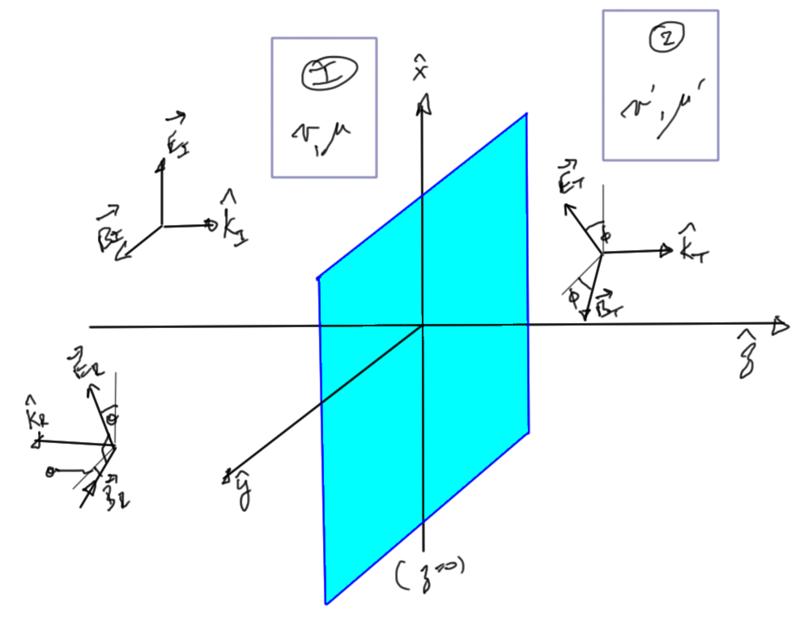 The equilibrium points were described with vectors as in fig. 2.1, where . We see that the equations of motion for the displacements of a system of harmonic oscillators has a rather pleasant expression in terms of projection operators, where we have projections onto the unit vectors between each pair of equilibrium position. 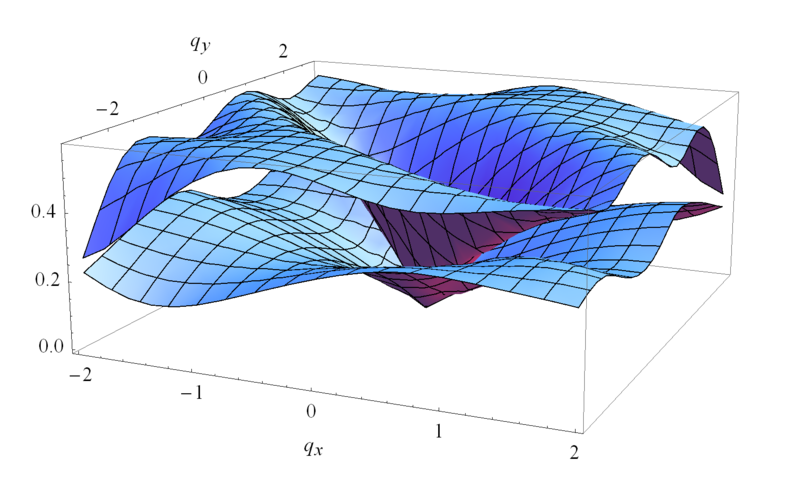 Now let’s consider masses at lattice points indexed by a lattice vector , as illustrated in fig. 2.2. This is an intuitively pleasing result. We have displacement and the direction of the lattice separations in the mix, but not the magnitude of the lattice separation itself. 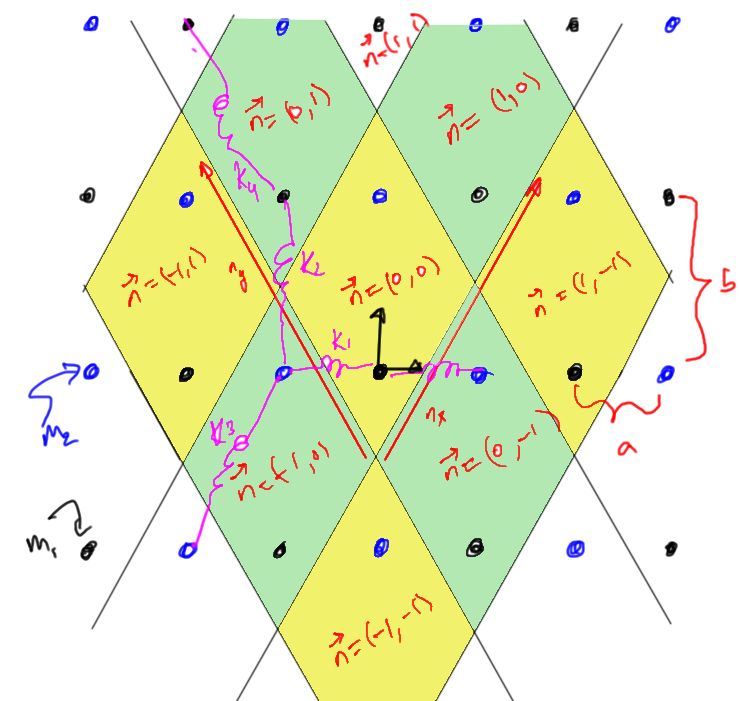 As a concrete application of the previously calculated equilibrium harmonic oscillator result, let’s consider a two atom basis diamond lattice where the horizontal length is and vertical height is . Indexing for the primitive unit cells is illustrated in fig. 2.3.